Just to give you guys all a heads up, tonight (2/3) at midnight (12am est) is the closing to purchase your TOGETHER passes for the music festival! SO GET PURCHASING NOW! click here for choice of passes. also, the line up and schedule has been updated! i’m jealous i’ll be missing out on Tuesdays <3Throb with Udachi and AC Slater, but i shall live vicariously through you guys that do go. seriously, you’re not gonna wanna miss that. real talk. The Together Crew will see to it that your week starting Feb 8 will be nothing less of mind blowing. Okay so what exactly IS Together Festival about? 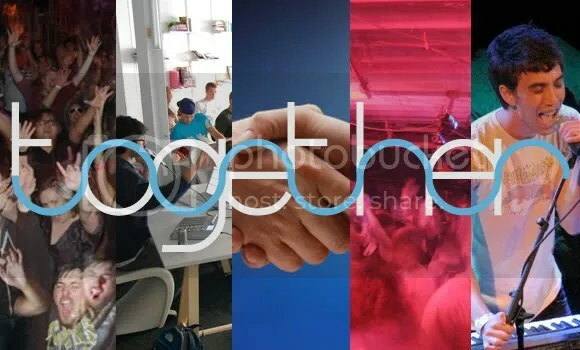 “Together: The New England Electronic Music Festival is a multi-venue, multi-party, multi-panel super event uniting not simply genres of music, but entire scenes once thought to be disparate. The city of Boston provides a unique platform as well, with its enormous student population, numerous technology centers and differing types of venues. *events run from afternoon to late night, please check schedules for time, place, and age, depending on the particular event! Over 30 events, 100+ performers, including a record fair, DJ classes, film screening, workshops and tradeshow. Boston is getting into some serious business. &most importantly guys, SPREAD THE WORD. Filed under Art, Events, Music, Party Time!